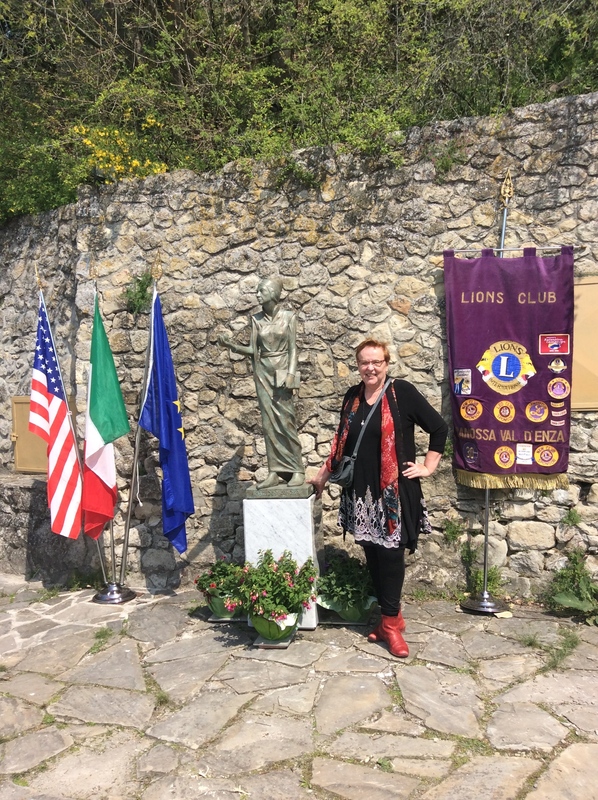 Around midday representatives of the local elite are gathering in front of my tower: the mayor of Canossa, the local priest, the regional historians, and many leaders and members of the local and regional Lions club, that supported the production of the monument. And of course the sculptor who made the beautiful statue, and Mario Bernabei, the guardian of the cultural centre ‘Andare a Canossa’. And beautiful she is. Matilda is represented as a tiny woman, with in her hands her well-known symbols: a pomegranate and a sacred book. She wears a simple dress, plus a head scarf. With a mystical gaze in her eyes she overlooks her lands. The officials memorize Matilda as a peace maker and a learned woman, and as a powerful woman who took the initiative for a new equilibrium between Church and State. Mario Bernabei praises her for the start that she made with the ‘laicite’, and as a precursor of modern feminism. And then the priest blesses the statue with water, while he guides us in joint ‘Pater Noster’. At the end everybody makes a picture of her/himself together with Matilda. And then it’s pranzo time! Suddenly I find myself at a lunch table with the local elite, with whom I engage in a nice conversation about the forthcoming Italian edition of ‘Queen of the Vatican’ and my vision for Canossa. What a special way to celebrate the start of the Matilda year…..!